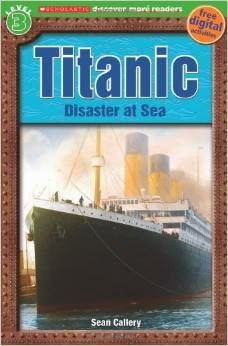 Mommy, we only have three books about the Titanic. Can you get some more? That's pretty much an "ask and you shall receive" type of question. My quest to find books about the Titanic that are age appropriate is in full swing! 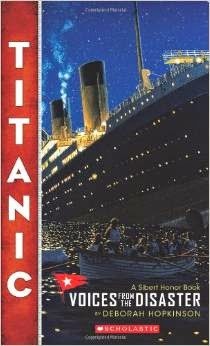 Titanic: Voices From the Disaster is written for late elementary to middle school readers, though it is an interesting read for adult readers as well. It would be a good resource for home-school teaching, and its bibliography is extensive and useful for further research on the subject. This book is arranged chronologically and clearly outlines what led up to the disaster and how it could have been avoided. One of the hard things about reading this book is how frequently preventable mistakes are revealed, any of which would have greatly reduced if not entirely averted the tragedy, i.e., if the ship had rammed the iceberg head on instead of scrapping along the side of it, or if the communications operator of a neighboring ship would not have turned off his equipment and gone to sleep, or, greatest of all, if the ship had been provided with enough lifeboats for all on board! However, to some extent, the tragedy is shown to have caused a great many improvements in the policies of cruise lines, disaster response, and shipping in general. It exposed how the regulations concerning safety measures on passenger ships were greatly out of date and is directly responsible for all ships now providing emergency equipment for every person on board. There were many times, though, when I had to put the book aside because the enormity of the useless loss of life was overwhelming. In particular, hearing from people who actually survived and endured the grief of losing their loved ones almost before their eyes, of families having to decide whether to send a few members to safety or all die together, made the stories, heard many times before (and almost glorified sometimes), become much more real and personal. Many thanks to Scholastic who sent a copy of this book in order to facilitate this review. We have received no additional compensation for this thoughts and all of the opinions expressed are our own. Bookworm2 has very much enjoyed the Scholastic Level 3 reader, Titanic: Disaster at Sea , by Sean Callery. We've read this book aloud to him numerous times and it has yet to grow old. This book is laid out in the typical manner for Scholastic's easy readers. Per usual, there are a lot of full-color illustrations and also photographs from the ship itself. The text is in large font and there are only 3-4 paragraphs of information per page making it an easy read but also an informative one. I found this title to be much more age appropriate and, as I say, he has enjoyed it. He has also enjoyed looking through our copy of T is for Titanic (Sleeping Bear Press). Now I'm on the lookout for additional titles. Might you have any to suggest? Oh! What's that one from the stuffed animal's perspective? ! Curious how he first learned of the disaster. Was it reading you did with him or did he stumble upon a book? I was about that age, 6 I think, when I first learned about the Titanic. 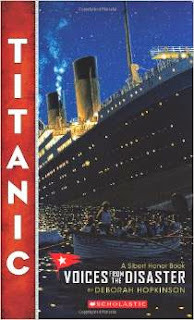 I saw a National Geographic film on the discovery of the Titanic. (I believe it was this one: http://www.imdb.com/title/tt0221425/) The ship was discovered when I was 5 so this was a recent film at the time. Anyway, it began a life-long fascination with the whole topic. Not sure why, it's a tragedy and I generally don't like tragedy, but I can't help it. Thanks for sharing these books. You might look for the National Geographic film - maybe it's on YouTube for post reading if you and Bookworm are interested. I second "Polar, the Titanic Bear" for children. We've had years of "Titanic fanatics" in our home and it's been a fascinating subject to explore. Also recommend "Exploring the Titanic" by Robert Ballard, though it is probably a bit wordy for Bookworm2. It probably follows the National Geographic film that Sarah mentioned. I think that's the one we checked out from the library. You might have to visit the exhibit in CA :) We really liked the traveling exhibit at OMSI years ago. The full museum in TN was tops!